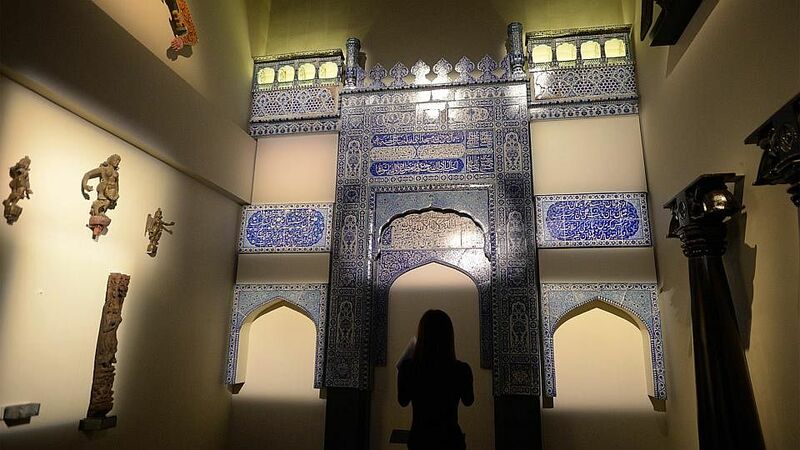 SINGAPORE - The new Indian Heritage Centre in Little India will open its doors to the public on May 8. 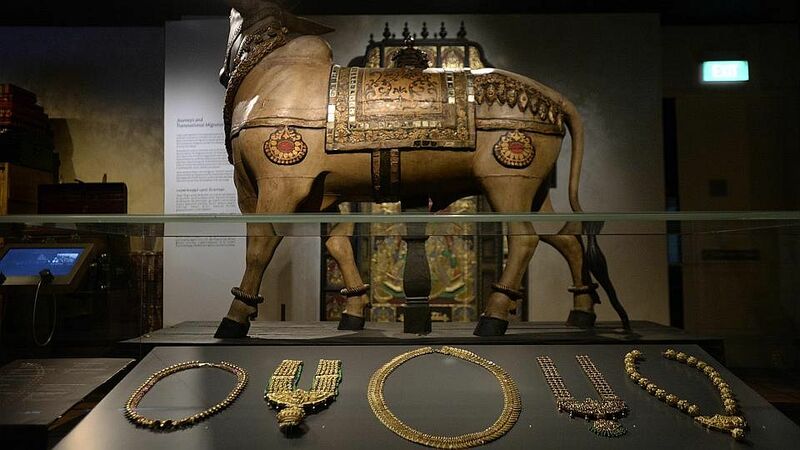 Located on 5 Campbell Lane, opposite the Little India Arcade, the centre is home to more than 440 artefacts - some of which have been acquired, donated or are on loan. Here are some highlights. A two-storey glazed ceramic tile mosque facade from Multan, Pakistan, dating back to the 1890s. It came partially assembled with some loose tiles. Mounters and conservators had to work on it like a jigsaw puzzle to recreate the appearance of what would have been the mosque's facade. The colour scheme features underglaze cobalt and turquoise blue on white slip. A pantheon of six stone sculptures associated with the Hindu deity Shiva. 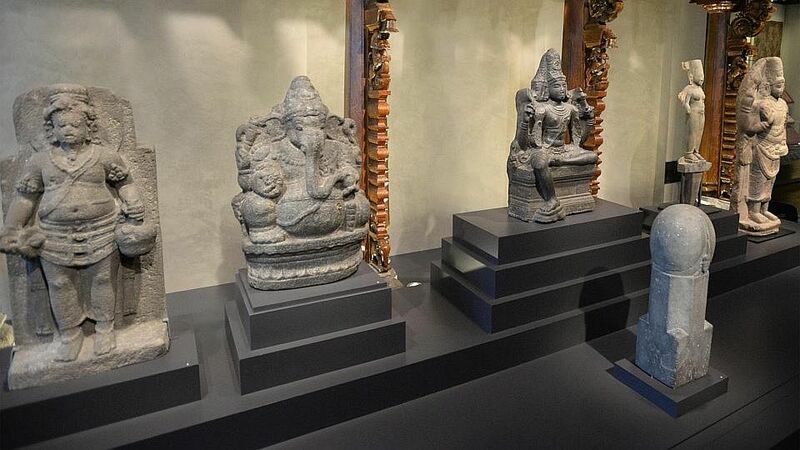 The statues come from the 7th to 11th century from South Asia and Southeast Asia. It includes a mukhalinga, a phallic representation of the Hindu god Shiva. Gold necklaces for the deity Murugan from various eras that belong to the Saigon Chettiars Temple Trust. A 3.4m tall wooden Chettinad doorway from the late 19th century with 5,000 minute carvings. It reflects the bespoke architectural style of South India's Chettiar community, which had acquired wealth from their moneylending businesses across Southeast Asia. Their wealth was pumped back into the Chettinad region where many of their residences are grand and palatial in form. It took conservators at the National Heritage Board's Heritage Conservation Centre in Jurong about 500 hours to clean and another 500 hours to stabilise the structure. 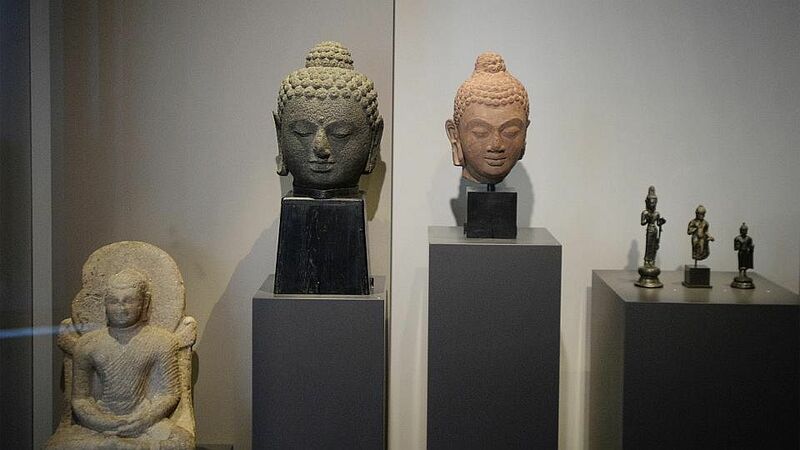 A red sandstone head of Buddha from the 5th century that can be traced back to the Gupta period stands alongside an 8th to 9th century Javanese version. Their likeness, including their similarly curled hair and elongated earlobes, illustrates the cross-cultural exchange between South Asia and Southeast Asia.